When evaluating patient for ankle pain, we often can encounter damage to the peroneal tendons. The peroneals are a pair of tendons that course around the outside of the ankle, behind the large bump called the lateral malleolus. The tendons include the peroneus longus and brevis tendons. Upon presentation to our office, the patient will report sharp or aching pain that often was preceded by an ankle sprain, or associated with frequent popping/snapping to ankle, or even an increase in activity. On examination pain is noted just behind the lateral malleolus and can extend all the way to side and bottom of foot or up into leg. Discomfort may worsen with pressure to site while the patient performs circular range of motion of ankle. Radiographs usually are taken to determine if and fracture is to blame for the pain but definitive diagnosis is made with use of in office ultrasound or MRI. Tears usually occur lengthwise with course of the tendon (longitudinal split tearing) not a complete rupture in half. 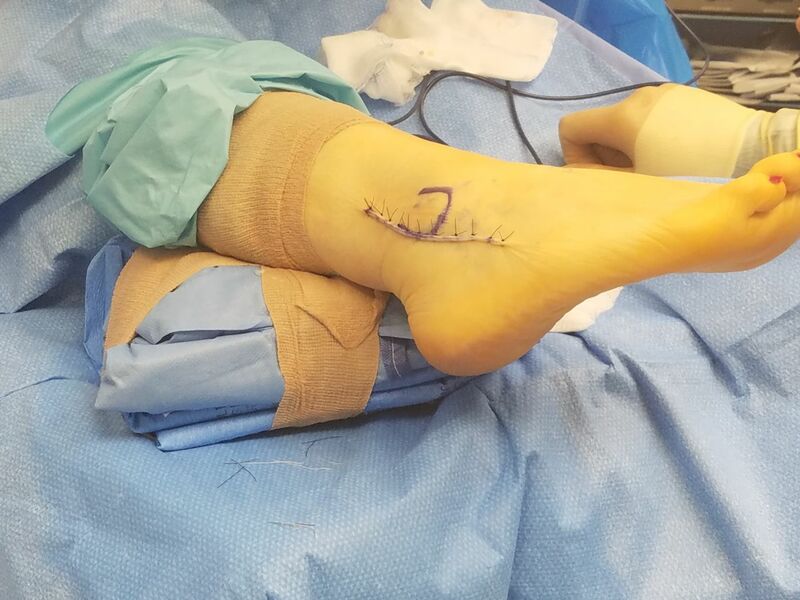 Once a diagnosis is made of a peroneal tear, treatment can be conservative in minor cases or surgery in cases were long tears are noted, conservative care has failed, or where complete rupture of tendon has occurred. Conservative care includes basic sports medicine including oral anti inflammatories, immobilization in brace or boot, rest, ice, compression elevation and physically therapy. If this fails to improve symptoms surgery is required to eliminate pain and heal torn tissue. Tendons are identified and incision is made in area where MRI/Ultrasound has identified tearing. In the following images the lateral malleolus has been identified and incision is made just behind this structure. The tendons course behind the malleolus. The images below show the repair of a longitudinal split tear of the peroneus brevis tendon. 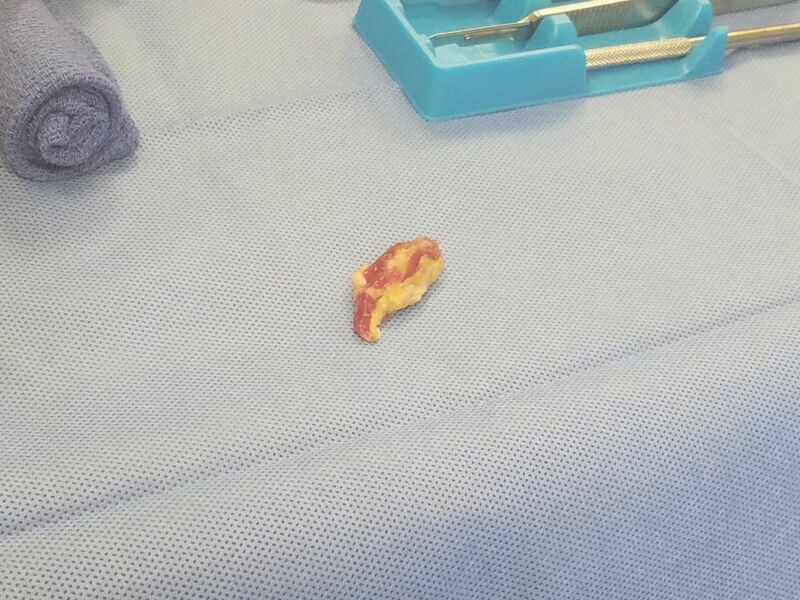 Here a longitudinal tear of peroneus brevis is noted with instrument passing through tear to identify injury. Low lying muscle is removed from peroneus brevis as it is often a source of pain. During activity, this muscle can become painful at this level as it enlarges during activity in this very small space. 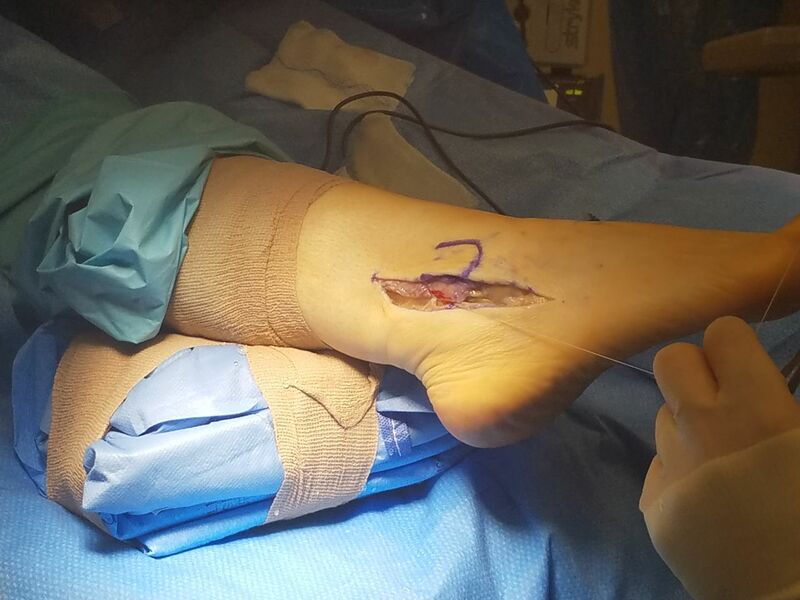 Tendon tear is repaired with suture and tendon is returned to tubular shape. 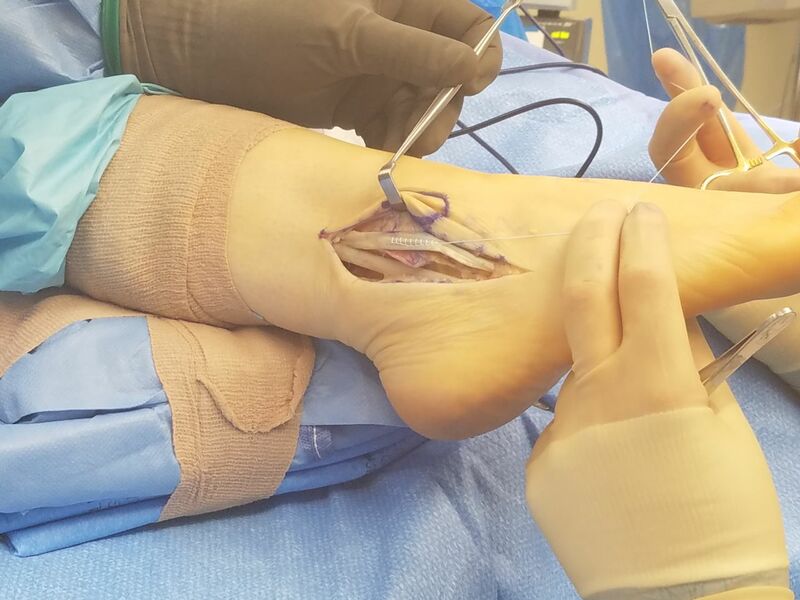 Any damaged tendon is removed prior to repair. The tear is repaired with suture above. The tendon sheaths and retinaculum(structure that binds tendons down) are repaired. 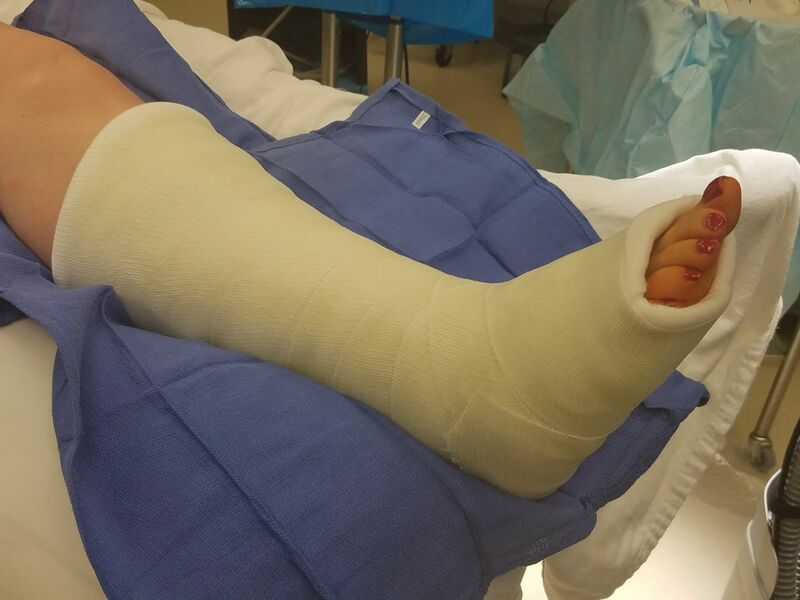 Patients will need to remain casted for 2-4 weeks depending on severity of tear, after which time they will transition to a walking boot for 2-4 weeks, and eventually into a lace-up ankle support and athletic shoes. Most patients return to normal activities slowly at about 8 weeks, will full recovery occurring at about 6 months. Once the cast is removed patients will undergo physical therapy to expedite recovery and decrease post-operative pain. Most patients make a full recovery without future limitations. The earlier the treatment either conservative or surgical the better the prognosis for full recovery. Come into Foot and Ankle Assocaites of North Texas to be evaluated and treated and recovery can be just around the corner.